- Color: Violet/Blue/gold All colors do vary somewhat from the picture shown. - Description: Track has designed the new 300T to be our second entry in the lower-mid performance arena. The 300T is constructed with the Track symmetric core, a proven core shape in the industry for several years. We then wrapped it with a brand new coverstock blend, the LMP GEN1T. This cover is designed to be very aggressive through the front part of the lane, and have a true “T” trackion shape in the mid lane. If you liked the 505T, this is its little brother. When your 505T starts to hook to soon just go to the 300T and keep on striking. This is a very unique color combination for Track, and we know it will stand out on the lanes. Each new ball from Track will include a microfiber cleaning pouch with instructions on its use. We feel this is a great addition in order to help our customers maintain their performance products. seem to make everything hook too much. This isn't the type of ball you want to swing. Play more direct on medium or drier conditions and you will be rewarded with forgiveness and good carry. First impression was the ball was a little over/under the ball reacted better playing more in the track. But after a surface adjustment the ball came to life and rolled great. I took the ball down to 1000 and then put some delayed reaction on it and it gave a whole new look I was able to move inside and still get the ball to recover and the carry was unbelievable. I can see this ball being a great tournament ball when the lanes start to burn up or if you have enough hand you can start with on the fresh I think the ball is more suited for playing in the track. This ball will complement the 300c and 505t very well it should fit right between those two. Once again Track makes a winner! You’re not going to see this kind of reaction from other low end balls. Likes: Strength of this cover is HUGE in this price point! Most every other entry level piece is designed for easy length and gives a pretty decent pop at the bottom. The 300T will really shine brightly among it's peers. It's a great entry level piece for a more speed dominant bowler. It rolls early and just like all of the Track "T" balls, it controls the breakpoint perfectly. This is a trait that the tournament player will love on the shorter patterns! 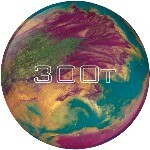 The 300T will be the perfect ball down from your 505T and also a great compliment to those who already have the 300C! I opted for 115x3x70. The ball is very early and very smooth. It was previously noted that the ball gives a better look in the track area and I don't disagree with that. The nice thing about this layout is it does allow me to bump in and take the slow roller approach to things without dealing with any over/under. Dislikes: So far, no dislikes. I think this was a great call on Fig's part. Building The Legion one member at a time! Likes:The 300T is a very readable ball with some teeth. The pattern I was playing on was the Los Angeles sport pattern and I decided to play the pattern alot straighter and on the gutter. This is my strong point playing straighter. I did also review the 503C on the same pattern but playing the lane completely different. The 300T is laid out 80X4X70 or 4 by 4 with an xhole 1 inch past. The 300T read the lane and gave me a very predictable break point much like the 300C but alot earlier. This predictable roll allowed me to matchup outside and direct with some room for error! That surprised me alot especially on a short pattern. I was the only person playing that far right and scoring! I cannot wait to use the ball where the pattern is a touch longer. The ball is a keeper and a must for any competitive bowler. Dislikes: I do not like colors! Likes: The 300T definitely is the little brother to the 505T. As the conditions broke down I was able to transition from the 500 to the 300 with little adjustment back to the right. The 300C was just not enough to get around the corner as pattern transitioned, but the T was able to give me just the right amount of mid lane move. On the THS the 300T is first out my bag at the moment, high rev players will love this ball as a bench mark ball. The 300T is a missing link. I went with a standard layout pin 12 o'clock mb 25 degreess, and when I tell you this is the missing piece I mean it. Some may have found the 300c to be real clean threw the fronts, but at times could be a bit strong off the friction. The 300t in my opinion is just about the same threw the fronts and ten times smoother down lane, and the hitting power is amazing if you dont have one you need this in your bag for medium to dryer conditions. It's great buy! Great for your THS and beautiful for late game tournament blocks. Likes: Really liked the way this ball made the corner after the breakdown started. My 300T has a 5.75" pin to PAP distance so it likes the friction, and really is vicious down lane once they have opened up a little bit. Being able to use this ball to open up my angles on the lane and still get great recovery and hitting power is how I am going to make money this season!!! Likes: I can't say enough about this ball. It has such versatility at this price point. Most low end balls right now are very clean through the fronts and more angular on the back ends. Those balls tend to perform good JUST the burnt up house condition. This balls has such a wider range of use. I have used this ball on fresh medium to short sport conditions. It evens out the wet/dry cliff that some house shots have. I have used this ball on house shot, cheetah, viper, and chameleon as MY BALL OF CHOICE. The carry never suffered no matter what the pattern was. THE BEST BALL ON THE MARKET AS FAR AS BANG FOR YOUR BUCK! Dislikes: Well I dont like this ball on the REALLY DRY conditions. The shell is strong and the core is weak, so on the dryer conditions i had some carry issues. However these are THE ONLY conditions that I had a problem on...... Also I hate the color, but some people may like it. Likes:Drilled my 300t with A 5X5 drilled same as my 300c just to get the ball to start a little earlier and hoping for a stronger roll to the pocket.For me it rolled a little stronger in the mids than I expected but still had a great turn to the pocket with okay pin carry.On the 41ft syn. the ball didnt go as early and reacted similar to my 300c but more of a strong arc. Likes:This ball rolls so well. Pin up on center line, cg kicked out slightly right (no weight hole needed, about 1/2 oz pw). Kept it at box finish (4000 dull). Plays oil line great, rolls (arcs) hard at pocket. I use this as my third game ball. First week, 207, second week : 245. Little too strong for fresh. Must have in bag type of ball. Should have bought two of them. "Where does he get all of these wonderful balls?" Likes: The 300T offers a "T" coverstock at the low-end price point, and while this ball does not handle the amount of oil that a 716T or a 912T will handle, it will still dig through medium oil offering the same type of motion as the stronger coverstocks. As long as you have an understanding of what to expect with the 300T (i.e. not a heavy oil piece, but also not a ball best-suited for dry lanes) then you should be pleasantly pleased by the reaction seen at that price-point. The layout I chose for that is the ever-popular "Rico" layout (pin in the palm, CG at 45 degrees, weight-hole 6 3/4" away from pin) which gives me a ball that wants to rev early, but because it isn't a super-strong ball it still skids through the front part of the lane and offers a controllable reaction on the backend. This ball is best suited for house shots of any volume other than H-E-A-V-Y and also is good on flatter patterns because of the chosen layout - I have thrown another 300T in the past (layout was pin under ring, CG stacked directly underneath - unsure of dual angle components though I could measure if absolutely necessary) and the older one gave me a similar reaction but a little stronger motion in the backend due to the weaker pin placement and lack of asymmetry in the ball (created by the weight-hole as a result of the Rico layout). With the correct surface preparation (I have only thrown both 300Ts at the OOB surface which is 800-1000-2000-4000 abralon) this ball will handle any type of medium oil pattern from the simplest house shot to the tougher PBA and Kegel patterns. As long as you are not expecting super-high-end performance out of a lower-mid performance ball, you will not be disappointed! Note: I would like to brag that I did shoot 300 the first full game off the press with this ball - this should not be your deciding factor in purchasing this bowling ball, I just wanted to brag! Dislikes: I'm finding it very difficult to think of a dislike for this ball, the only one I can come up with is that some people might be turned off to the ball by the very VIBRANT color scheme, to those people I say, deal with it and don't miss out on a great ball because of the color!! Here are some shots of me with my 300T at the USBC Open. Some were good, some were bad. But the ball was perfect for the shot. Likes: If you are looking for a smooth ball on a light/medium house pattern, this is the ball for you. The coverstock offers the same "T" motion characteristics as the 716T and 912T, at a lower price point. This ball gets through the front with ease, and gets into a roll in the midlane and is super smooth off the end of the pattern. I have mine drilled 50 x 4.5 x 35 which puts the pin above the ring finger and the cg kicked to the right about 1.5 inches. I haven't touched the surface on it and I don't intend to. This is a great go-to ball on your THS. Dislikes: Not much dislikes about this ball. Only one I can think of was how hard it was to get out of my hands when I needed something longer. This is a great benchmark type ball and it can't be beat at the price. Page created in 0.716 seconds with 21 queries.